In this excerpt from their new book Come Together: The Business Wisdom of the Beatles, authors Richard Courtney and George Cassidy discuss how Paul did what every good leader tries do with a failing enterprise, change the strategy to save the business. When the company begins a downward spiral, someone must take control. That person must have the best interests of the company as top priority, and the welfare of the members as a secondary focus. However, there are limits to what that person can accomplish if he attempts to manufacture a return to the good old days, especially from the top down. Esprit de corps must come from shared goals, and new circumstances call for new ways of working–and new ways of leading. In Liverpool, as Badfinger’s Joey Molland has noted, the band had always been the thing: a unit, inseparable. But by January 1969, Paul could see the Beatles slipping away. John Had Yoko, Ringo his acting career, and George, his devotion to a newfound religion. In an effort to bring the band together, Paul began to float the idea that returning to their roots would revive their flagging spirits and interest, and rekindle the friendship and camaraderie that they had enjoyed before. He tried to persuade them to play live as they had in Hamburg and the Cavern. That failed. He then decided to have them play live in the studio. The concept of the film Let It Be and its accompanying album was to write and produce songs quickly–as in “the old days”–and then to perform them, if only for the camera. Nevermind that the Beatles’ greatest accomplishment to date had been their swift, incredible, and unprecedented musical and lyrical progression from the novice Merseybeat albums such as Please, Please Me, moving rapidly through mid-period gems like Revolver, enhanced by increasingly sophisticated studio trickery and the judicious use of new and unusual musical textures, and finally to late-period masterpieces like Sgt. Pepper and The White Album, in which they bent whole orchestras, and seemingly the whole world, to their supple whims. Paul found out the hard way you can’t go home again, or get back to where you once belonged. Eight days into the session, George quit. Harrison had matured musically, and Paul–the overweening big brother figure–could do no right by him. The slightest instruction–or suggestion–from Paul set him off. There was open rebellion, and for the time in as many albums–disregarding Yellow Submarine–a Beatle had quit. The entire, sad event was recorded on film. Ironically, Paul’s notion of filming a return to the carefree days of yore caught instead the disintegration of the band and somehow effectively foreshadowed the encroaching gloom of the hairy, beige, dispirited 1970s, with their persistent political conflicts, gas shortages, scandals, stagflation, and pronounced lack of Beatles. Paul, by badgering the others into making the film, and by offering numerous suggestions to George, and in a thousand other ways, was, as a good leader should be, operating for the good of the enterprise. He may have been seeking in good faith to lead by example, but unwilling or unable to accommodate ways of working outside his own comfort zone, while simultaneously asking for the others to stretch outside theirs, he dominated the proceedings, pushed his partners away, and brought the business into further disarray. 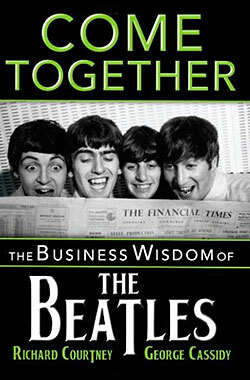 Excerpted from Come Together: The Business Wisdom of the Beatles by Richard Courtney and George Cassidy, ©2011 Turner Publishing.